Gibson SG's with Ebony boards....which years? Discussion in 'Guitars in General' started by clay49, Feb 15, 2012. In the late 60s, I picked up a used white '61 or '62 SG Custom with a "Fretless Wonder" ebony neck, & another new mahogany stained version of the same guitar around '71. I don't, however, know about the production runs. The models I have seen have been recent Gibson USA issues (within the last 15 years or so), not Custom Shop/Historic. I would think that an original 62, or even a '71 would be way out of the range I would care to offer up for one! 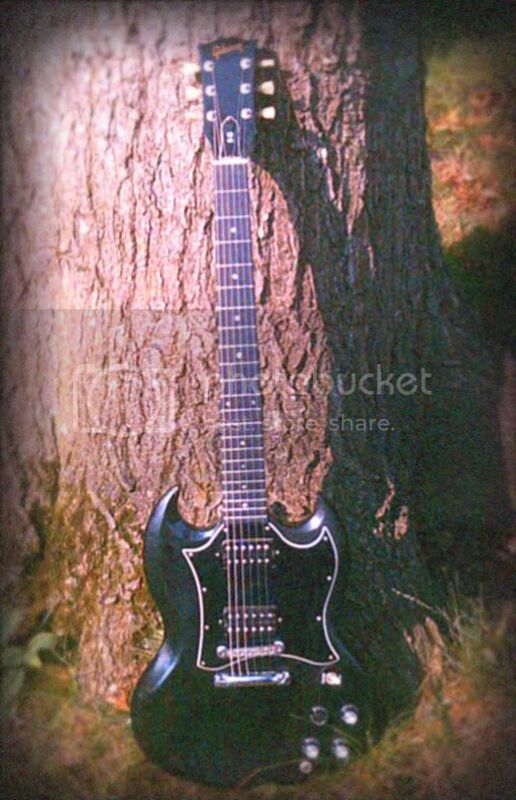 The original Faded SG had an ebony board. I believe the Gothics did as well. And the SG Elite was ebony as well. Of course Customs do too. That's a great site for any SG fan, and will provide you with lots of info. The Gothics, the Menace, and Voodoo all had macassar ebony, IIRC. The SG Supreme has ebony as well. My 2002 Faded has an ebony board. I have a 2007 SG Standard from the GOTW series that has an ebony board. Mine did as well. Also had killer half moon inlays. I never should have sold that guitar! smolder and Alistair6 like this. I'm sure as hell not selling mine. It's also a single piece body. Not getting those from Gibson at $599 anymore. * disclaimer: I don't know or care if it does or doesn't affect tone. But it does look nice. The Gibson SG Goddess had it. It does. I've owned a rosewood board SG Standard and now own an ebony board SG (white one) and it's definitely snappier/faster. Also a tiny bit brighter sounding. Horses for courses, I guess. I just worked on a customer's 2000-something Faded SG and it had a very thick ebony board, which I thought sort of choked out the mids in the tone and some of the 3D vibe-iness of the repsonse, and just made it too linear sounding, and less growly somehow. It was, however, very snappy and bright. Don't get me wrong, I want an SG with an ebony board too, but if you have the time, my advice is always (always) play 10 of them and get the best one. Dannyz, Dale and jhale like this. Every year it seems Gibson/Gibson Custom produce certain SGs with ebony boards. They are not rare. Just got a '93 Standard with a board that absolutely must be ebony. It's consistently black throughout. Cannot wait to plug this thing in and let my Iommi rip.